As we now have working Public Key Infrastructure, we are ready to use it for more than encrypting traffic (which is already encrypted by Tor). We can very easily turn on client verification on our server. This will prevent anybody not having valid certificate issued by us from visiting our hidden webpage – just in case hiding domain name in hidden services version 3 leaks the name somehow (which should not happen anymore in v3). 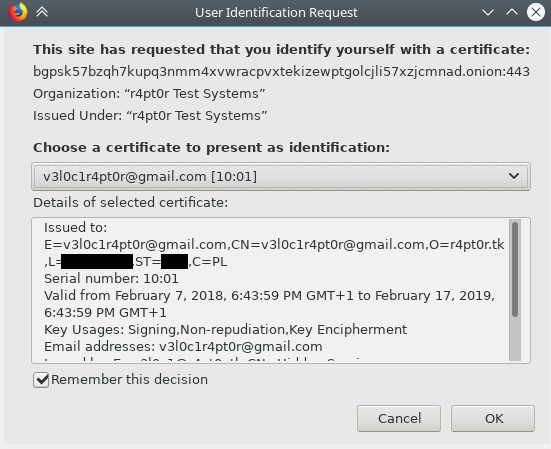 In this part we will issue client certificate (the procedure is almost identical to server certificate), then configure httpd to require client identification and finally configure Firefox to try sending the certificate. Let’s go! 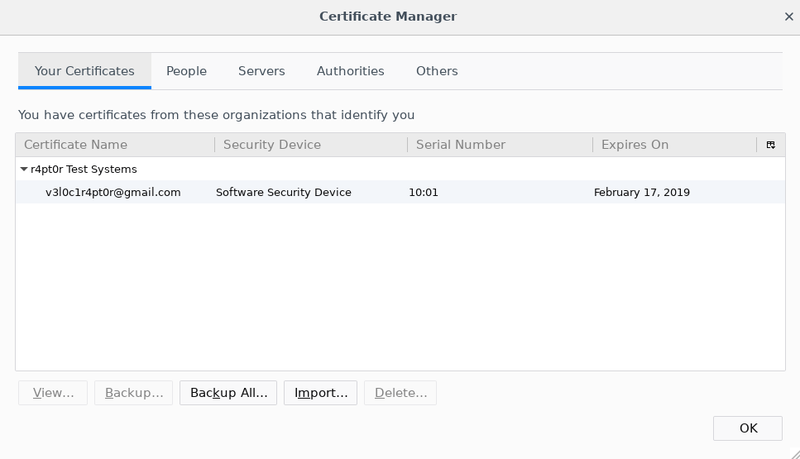 In my case tmp directory emulated client machine and ca is my Cerificate Authority, which issues certificates. We start by creating request on client side, then sign it on CA side. Last step was packaging certificate and key into PKCS#12 container. That is for securing key (we can encrypt it with password), and is a form required by Firefox. After creation of .p12 (and verifying it is fine), we can (and SHOULD) delete source files, as they are not protected in any way. To enforce client verification, following lines must be added to virtual host configuration, in our case it might go just after SSL certificate file paths. We have to reload httpd for changes to take effect. At last, to start using newly generated certificate, we should install it to Firefox. The procedure is similar to the one with CA certificate. We need to open Certificate Manager window. Then, instead of going to Authorities, we go to Your Certificates. Then we click on Import and select .p12 file. Finally, after confirmation, you should see your hidden service content. Congrats!